When is the Best Time to Have Windows Cleaned? Warmer temperatures mean it’s finally time for Spring window cleaning! But is now the best time to have them done? Having crystal clear windows is a big plus to enjoying the view outside, but when is the best time to have your windows cleaned? If you live in the Bitterroot Valley you know the weather and outside conditions can be rather unpredictable and counterproductive to keeping clean windows. April: The rain can leave water spots on a window, leaving it less than pristine. May: April showers bring May flowers, but that means pollen in the air and on your windows! June: There’s cotton floating in the air. It’s everywhere, on the windows, on the screens. July: August – Who can forget fire season? Smoke is in the air in the Bitterroot around this time, sprinkling everything with a layer of ash. September thru October: It’s raining again! There isn’t an absolutely perfect time. As we’ve discussed, there is usually something to mar the beauty of a perfectly clean window. Therefore, we recommend having your windows cleaned twice a year. A common schedule that many of our clients choose is to have both insides and outsides cleaned in the spring, and outsides only cleaned again in the fall. You’ll notice that with clean windows, things like raindrops won’t leave muddy streaks and a thin layer of pollen won’t have preexisting smudges and spots to amplify. Having your rain gutters cleaned once a year is optimal as this keeps them empty and able to do their job of removing excess water in the proper places. A gutter that has accumulated lots of decomposing plant matter and soil can start to grow moss and other plant life. It’s best to couple gutter and window cleaning since gutter cleaning can leave the walls of your home dirty with runoff from the cleaning. 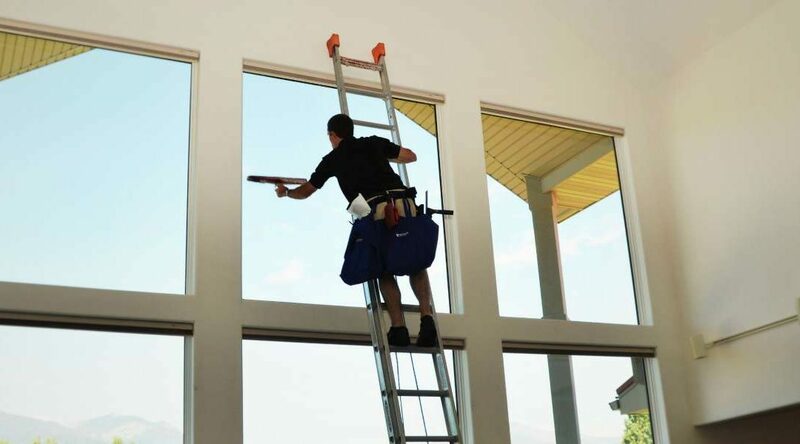 If window and gutter cleaning are scheduled together, the cleaning technician can simply rinse the walls of the home and then clean the windows afterward — kill two birds with one stone! Let us take care of the difficult stuff. High windows can be a challenge to keep clean. We save you the hassle of climbing a ladder, the danger of falling, and the unpleasant discovery that there is a wasps’ nest up there! We take care of those pesky bug spots and hard water stains that don’t want to come off. We even brush off (or wash upon request) your window screens. Click here to learn more about our window cleaning process or to get answers to frequently asked questions. Give us a call today at (406) 642-3545 to schedule services or to get a FREE estimate! My hardwood floor got wet – what should I do? The ground in my crawlspace is wet – should I have a vapor barrier installed?